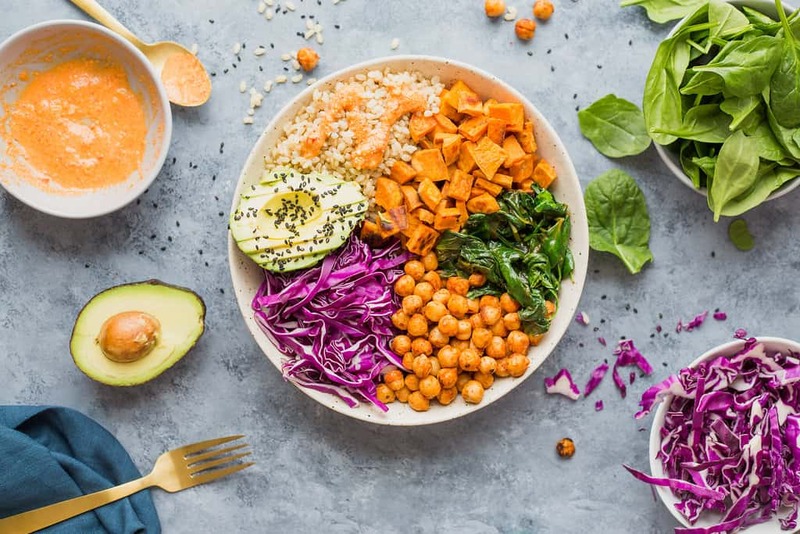 It seems everywhere you look online there are images of overflowing, colorful bowls that look more like a work of art than something you would eat! 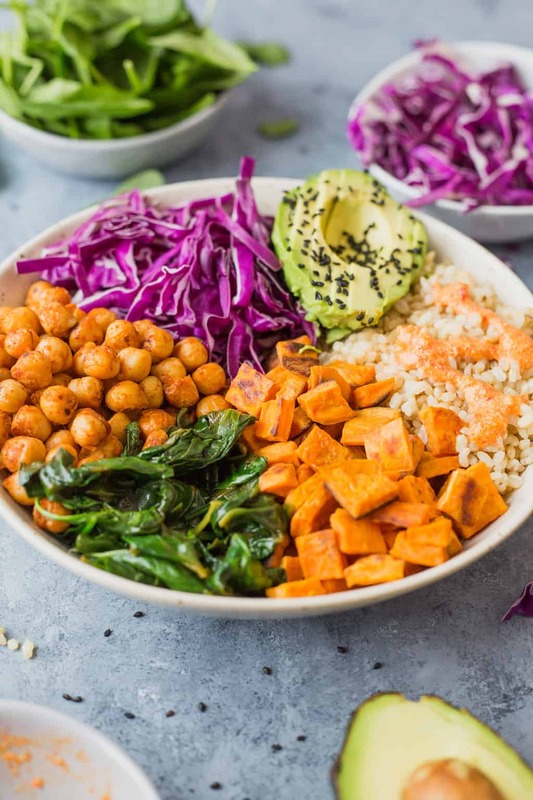 Yes, you can always sign me up to delicious and cleansing goodness in a bowl, but there are so many combinations it’s mind boggling. Well, after trying so many, I wanted a simple Buddha Bowl. 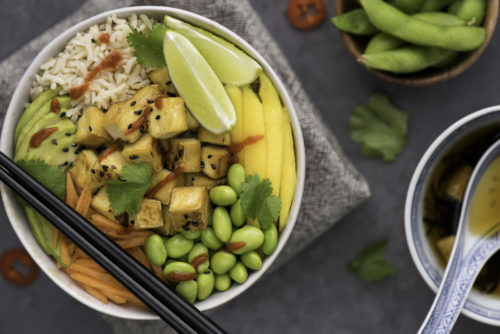 Something that could keep me going all day or be easy to eat at night, but with the right flavors and textures that made a Buddha Bowl what it should be – a joy to eat. 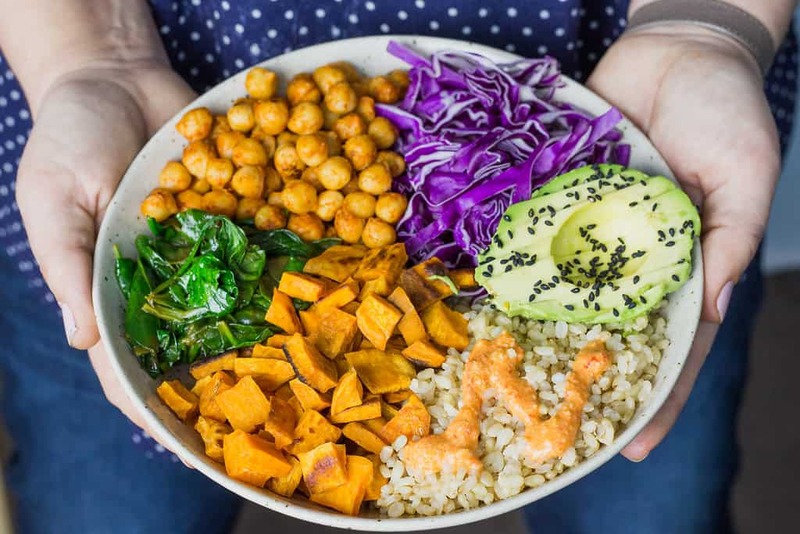 So here it is, my ‘Big Mama’ Buddha Bowl! Big Mama because, well, it’s big – and I like it that way! For textures: the crunch of cabbage, crispiness of potatoes and/or chickpeas, and the soft avocado and spinach. 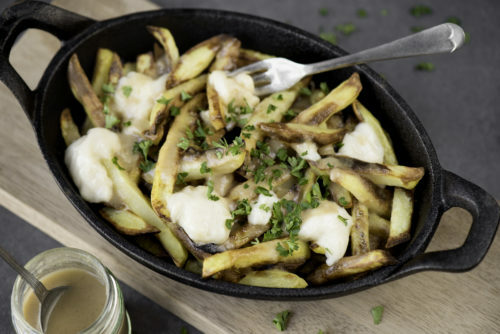 For the flavors: the earthiness of cumin and paprika, the brightness of the tahini and lemon, the sweet of maple syrup and sweet potato. Remember to kick off with boiling the brown rice, unless you opt for a different grain, as this takes 50 minutes. Once this is done you will have everything else ready in the meantime. If you do want this done quicker use another grain or swap for your favorite – I usually do and swap out for quinoa when I want to dig in sooner! I used to make this with a red pepper dressing, but frankly I fell in love with Minimalist Baker’s tahini, maple syrup and lemon dressing. This works perfectly with the earthy flavors of cumin and paprika, so have added it here below. Bring 2 cup water to a boil, (if you have it, add a stock cube so the rice is cooked in broth/stock rather than just water). Add the brown rice with a peel of orange (optional - citrus when boiling any short grain works really well). Fast simmer rice for 50 minutes. Fluff and serve when ready. Roast at 400 degrees for 15 minutes, flip, and roast further for another 15 minutes. They should be crisping at the edges. Heat a medium sized pan on a low to medium heat with 1/4 tsp of oil. Add spinach and wilt to dark green in the pan with a dash of water for steam, 1 tsp lemon juice and salt and pepper. This should take only a minute or two. Open the can of chickpeas and drain, rinse then pat dry. Swish around in a bowl with 1 tsp of oil and 1/4 tsp of sweet paprika and 1/4 tsp of cumin. These spices will balance beautifully with the sauce and sweet potato. Heat a skillet or pan to a medium-high heat. Add no oil, the chickpeas have all the oil they need. Flash fry the chickpeas, stirring every 20- 30 seconds seconds, for 4 - 6 minutes. Keep them moving! Mix ingredients for 20 seconds and let rest, then repeat. Use a little warm water if necessary to thin. Arrange around the bowl in segments so you can get good mouthfuls of everything! Sprinkle sesame seeds on the avocado and top with the dressing.